Call 02380 080681 now. Let our no win no fee* solicitors help you to claim for coach and bus accident compensation claims in Southampton. We can support all victims of injury involving a bus or coach. If you are living and working in Southampton and Hampshire, or were simply visiting when involved in an accident with a bus, or were injured on a bus, then call us immediately. Our personal injury lawyers are specialists in helping people to claim for compensation due to injuries and financial losses sustained after accidents on or with buses and coaches. Who Can Claim for Bus Accident Compensation in Southampton? In simple terms, if you have been hurt, and it wasn’t your fault, then there could be a bus accident claim that we can help you with. Common scenarios that we have dealt with include passengers who have been injured when a bus or coach pulled away or suddenly stopped. We are also able to help drivers and motorcyclists who have been hit by a bus or coach, a bus driver who has been assaulted or a victim of violent crime by a member of the public, or pedestrians involved in bus accidents. 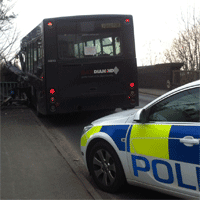 How Much Bus Accident Compensation Will I Receive? Bus accident compensation amounts in Southampton will vary wildly from case to case. Someone who has been seriously injured in a coach accident will invariably receive a higher compensation payout then someone who might have just suffered bruising during a bus crash. Our accident claims solicitors will actively pursue the highest compensation payouts possible for our Southampton and Hampshire clients. We will always go the extra mile to ensure that our clients are adequately compensated for their injuries and losses after a coach or bus accident. Personal injury claims typically come in two parts. Your personal injury solicitor will look to recover damages for pain and suffering, but also look for compensation for costs such as loss of earnings and any expenses that can be attributed to the accident itself. If you call us today one of our accident claims specialists will be able to take initial information from you about the circumstances of your claim and then tell you whether or not you are eligible. We work on a no win no fee* agreement so our Southampton solicitors and lawyers work on your behalf and are only paid upon a success. You don’t have any financial risk that way. You will receive the entire compensation amount as our solicitors success fees will be paid from a special insurance scheme.